Last May a neighbor received a basket full of small violet plants for Mother’s Day. She admitted that she didn’t have a thumb of any color resembling green, and consequently, without adequate water, light and care, the three plants shriveled up and died. Or maybe not. When she said she would be throwing them out, I asked if I could attempt to bring them back to life. She didn’t care one way or the other, and so I brought them home and loved them back into existence. As the three plants recovered, I realized that there were multiple plants in the pots. When they had reached sufficient health for me to risk it, I carefully separated them to end up with eight plants. 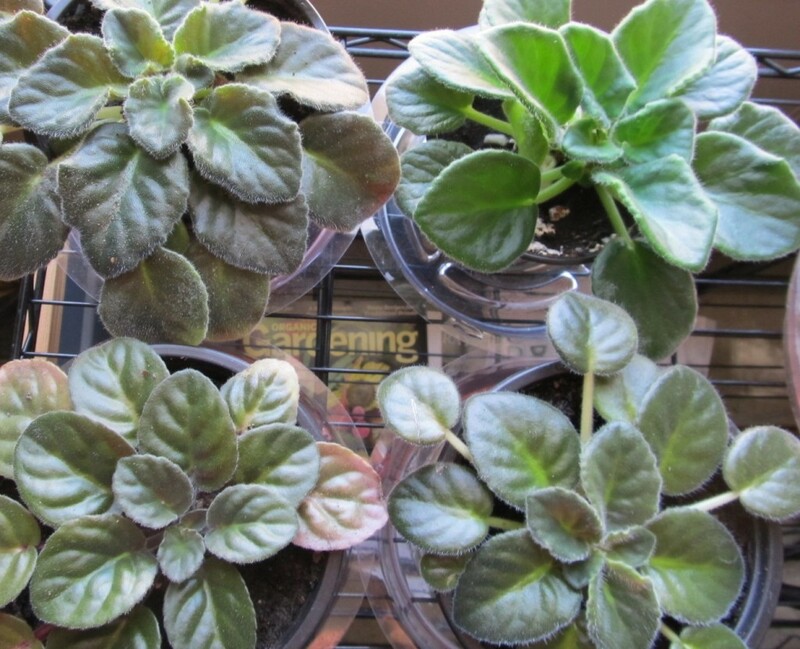 Since it takes an African Violet about a year from beginning to flowering, these eight are now nearly two years old. The photo shows all eight in flower, although the buds of one haven’t quite begun to open. When the late afternoon sun brings the colors to life, gold sparkles imbedded in the petals dazzle. I had never noticed that about these plants before. I often sit just looking at them, mesmerized by their beauty. In summer, I will close the blinds as the sun becomes too hot for safety. The plants thrive in bright light or moderate sun. I had never tried to begin a new African Violet from a leaf, but with so many beautiful colors, I thought it would be a shame not to try. In separating the plants, leaves are often broken from the main plant, and so I used these. Those that are not too large are best. This photo shows these hopefuls in their own pots. I have cut the stem a little more than an inch long on the diagonal and pushed it into the soil with the cut side of the stem facing up beneath the surface. Sometimes it takes poking a hole in the soil to ensure that nothing is broken on the way in. 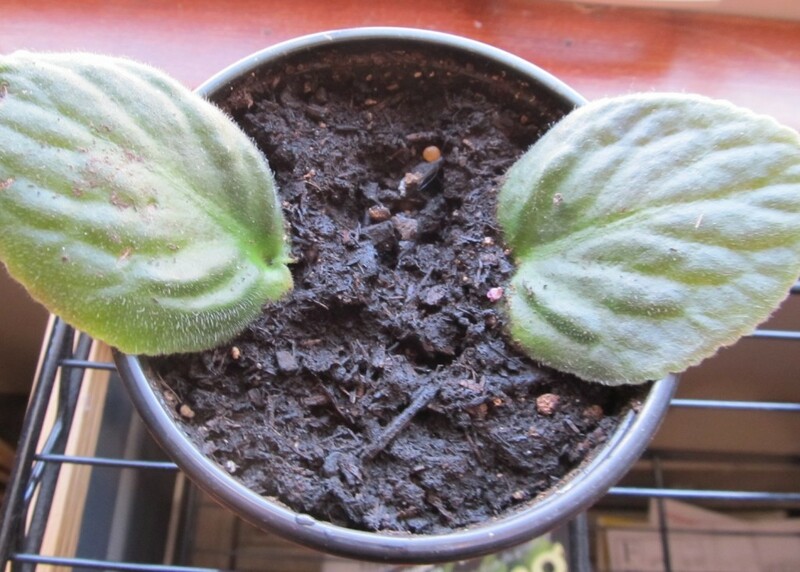 African Violets are crisp and easily damaged. Not all attempted starts will be successful, and it often takes many weeks before it can be determined whether anything is going on, but when there is, it is quite amazing to see a tiny new leaf appear. This can be either in the front or hidden in back of the leaf. I leave the old leaf attached until the plant is established. 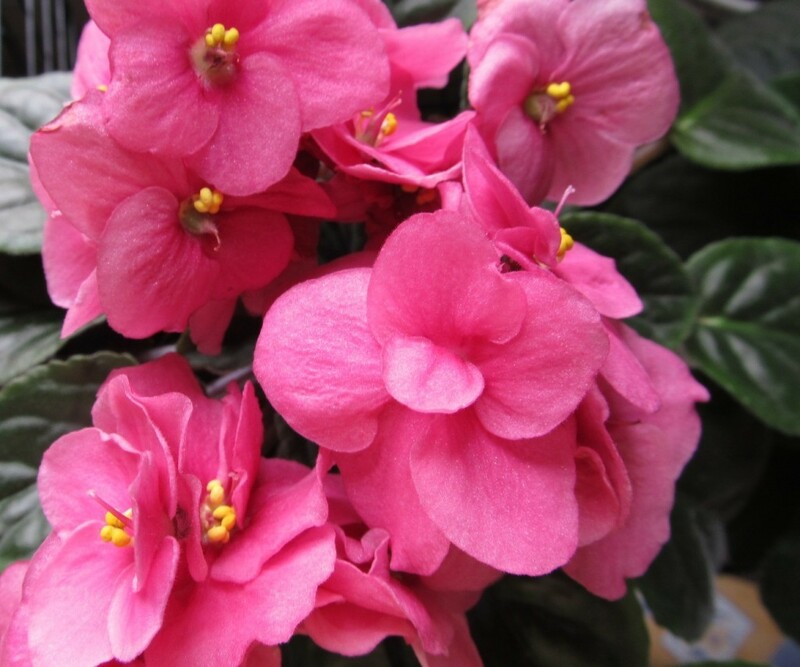 African Violets have relatively small root systems and once they are established do well in pots about one third the width of the plant itself. This photo shows one-year-old plants whose buds are just beginning to be visible beneath their leaves. Their pots are a little larger than necessary, but they will grow into them. The lower leaves of the plant should rest on the rim of the pot, and pots with rounded rims are best. Old lower leaves can be removed when they become discolored or damaged, and when the bottom of the stem looks a bit bare from pruning and has hardened some, I estimate the length of stem that will be buried to bring it back to its former glory and cut back the same length from the bottom of the root ball. The plant is repotted in new soil in the old pot, or a new one if it is warranted. 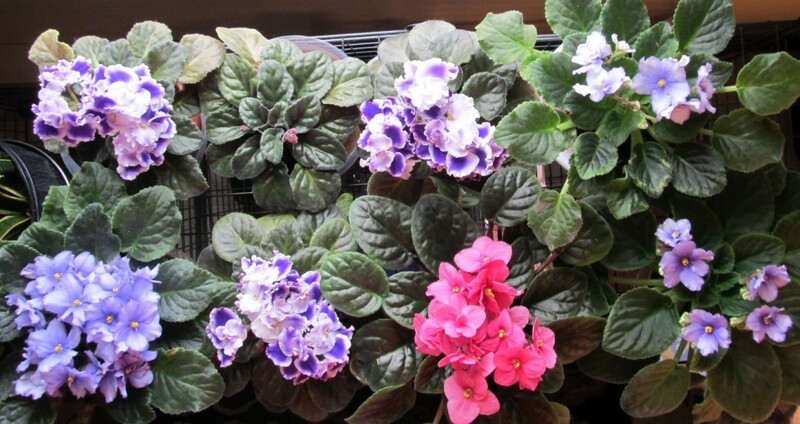 African Violets don’t like to go dead dry, but overwatering will harm them, and can cause root rot. If the lower leaves begin to show yellow, they are getting too much. Once a week, or every five days or so in hot weather, seems to work for me. At one point I was watering too frequently and saw the yellowing leaves. I removed them, repotted in drier soil, and managed to save the plant. Put them in water so that it covers about the bottom two inches of the pots, leave overnight, then return to their saucers. You can water the top soil, but since water in the crown (center) of the plant can also cause rot, the overnight soak seems to be the safest method. 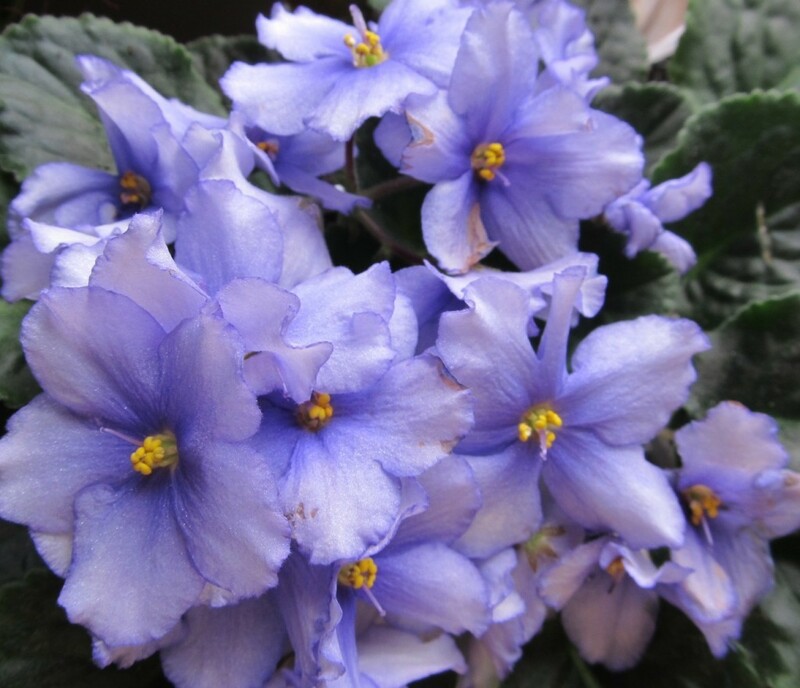 Some African Violet bagged soil contains months worth of fertilizer. I have also had good luck with regular good quality potting soil and fertilizing about once a month. I owe my success to having put some time into studying the lifecycle of these flowers and, of course, reading the expert advice available online. If you have any questions about my process, please send them, and I’ll respond.